Delta is derived from the Black-Scholes model. 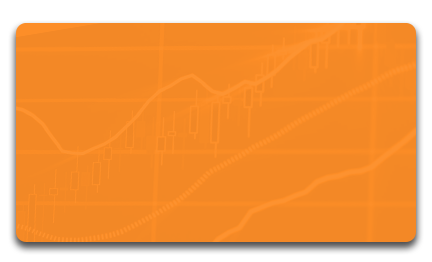 It measures the effect of a $1 change in the price of the underlying on the option premium. Thus, delta shows by how many units the premium is going to be increase if there is a one unit increase in the price of the underlying. Delta is also called hedge ratio, because it shows what percentage of the face value of the option should be purchased/sold to offset the price changes of the underlying (directional risk). The absolute value of the delta is expressed between 0 and 1. The delta of a deep OTM option is close to 0, while a deep ITM option’s delta is close to 1. Close to the strike price and to the maturity, the delta is changing quickly along with the premium. One can observe that option premium does not move linearly with the price change of the underlying. Moving from OTM towards ATM makes the premium’s growth accelerated. After passing the ATM point, this growth will show down. As a conclusion: when speculating with price increases, instead of buying a deep ITM option, one should buy the underlying product directly. In this case, buying a slightly OTM option can grant us higher return. Calls have positive delta, because they are like long futures and the return is derived from the increase of the future’s price. Puts have negative delta, because they are like short futures and the return is derived from the decrease of the future’s price. As an example: if call option has a delta of +0.5, then a $0.1 increase in the underlying’s price (if all other variables hold constant) would result a $0.05 increase in the option’s value. On the contrary, a $0.1 decrease would make the value of the option fall by $0.05. 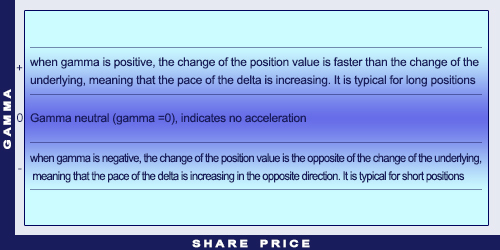 Delta can be interpreted as the probability of an OTM option to become ITM option. An investor is delta neutral when selling two call options along with a future. Then the value of delta is 0. This means that selling 2 calls offsets the price movements of the future in any direction (not considering the other variables). Delta neutral situation can be achieved with two options as well. Gamma is derived from the Black-Scholes model. 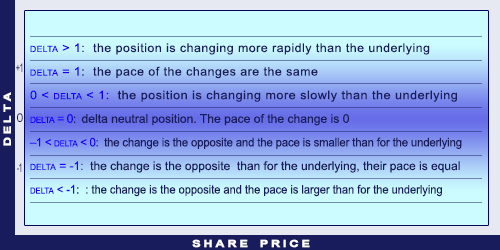 It measures the effect of a $1 change in the price of the underlying on the option delta. 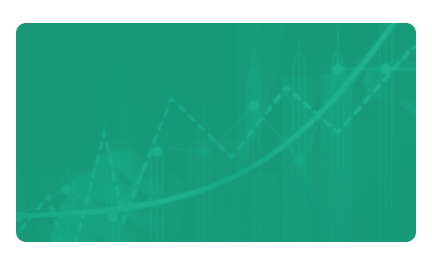 In absolute value terms, ATM options’ gamma is the largest. Deep ITM and OTM positions’ gamma is close to 0. Gamma is differently observed from long and short position owners. Option buyers want positions with high gamma. When the price of the underlying changes in the beneficial direction, the delta will increase more (than for positions with smaller gammas). Thus, the premium will increase more as well. For an unbeneficial price change the delta will decrease more and the premium will lose less of its value. A high gamma intensifies the impact of positive changes and lightens the impact of negative changes. Option sellers need exactly the opposite to happen. The gamma effect is the difference between an option and a future (for which the gamma is 0). Gamma is especially important when examining the sensitivity of a delta hedge. When gamma is high, delta changes quickly and even a small change in spot price can result the position to be over- or underfunded. The closer the expiry date, the bigger the gamma’s role and the more sensitive the delta hedge. Theta is derived from the Black-Scholes model. It measures the effect of a one-unit change in the time on the option premium. Theta quantifies the impact of the time decay. It shows how much the option’s premium decreases for a one-unit decrease (usually one day) of the remaining time until maturity. The closer the maturity, the faster Theta grows and the more value long positions lose. The acceleration of the time decay is more intense for ATM positions than for ITM and OTM positions. The more ATM the position, the larger the theta (if the expiration is the same). High theta is beneficial for the sellers of the options (short position). There is a special exchange between theta and gamma. 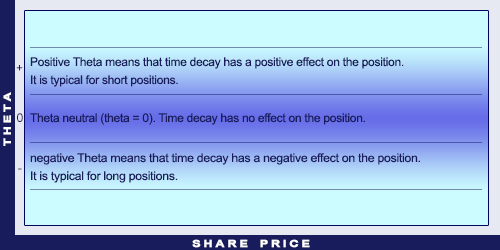 It is true for both cases that the closer the expiration and the more ATM the position the higher the value of the Theta. However, high gamma is beneficial for long options, but because of the increased time decay, large theta is beneficial for short options. Theta is derived from the Black-Scholes model. It measures the effect of a one-unit change in the volatility on the option premium. The farther the expiration and the more ATM the position, the higher the vega. Rho shows the impact of interest rates on the value of the option.